Well obviously today is Christmas Day so we’ve had a lot going on, leaving me very tired and very achy – my ginormous Christmas dinner didn’t help matters much on that front! 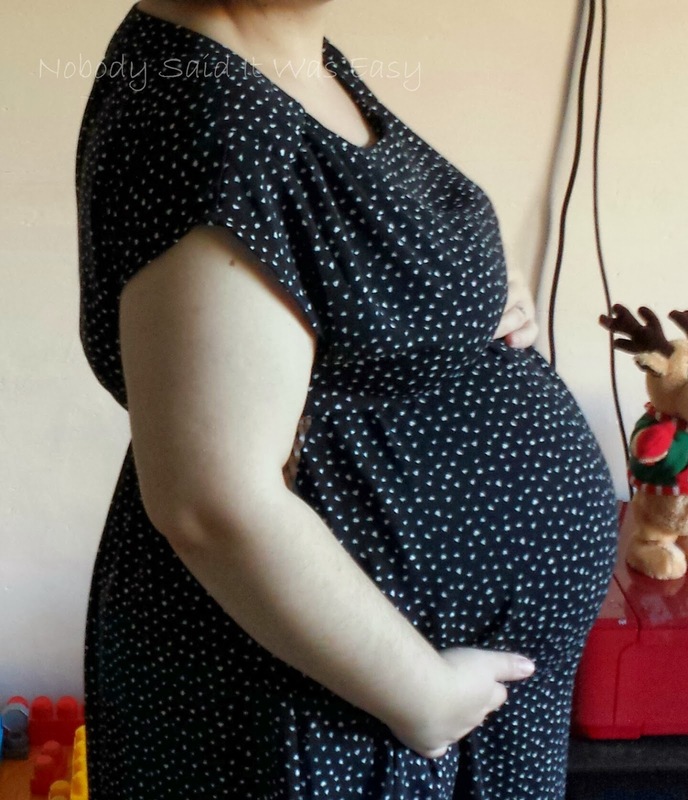 Though I did manage to take another bump photo (pre dinner!). Today was Christmas number 2 at the in-laws, so again a bit of a busy day. Think baby has been in an awkward position though as I haven’t managed to get comfortable all day. Today was MOT day – I shouldn’t have really had another second time around until 34 weeks, but they booked me in at my last one as they didn’t have the new diary for 2014 yet, so in theory I got an extra check up! Not a lot to report; my BP is fine, baby is well with a good strong heartbeat, they are lying really low down (which could explain my constant backache), and I’m measuring 30 weeks – I also measured this at my 28 week MOT but I think baby was in a different position today. I also seem to have developed heartburn this time. Not been feeling well today, just generally under the weather. I woke up with a pounding headache, in turn making me feel dizzy all day. I then pulled my back whilst bending down to pick something up. After that my knee gave way in the supermarket. And then the heartburn! I really wanted to stay up tonight to see in the New Year, but at the same time I also just wanted to go to bed! I’m not really one for going out at New Year anyway, even more so when pregnant. So we just stayed in and ordered a takeaway, and I drank fake fizz. Somehow, I managed to stay up but I was in bed five minutes after midnight! At 31 weeks, berry is the size of four navel oranges. They are starting to shed the lanugo and the hair on the head is getting thicker. They are gaining more weight as baby fat is filling in under the skin. Their colour is becoming less red and more pink. Their irises can dilate and respond to changes in light. They can turn their head from side to side. They are expelling more and more waste due to the increased intake of amniotic fluid.